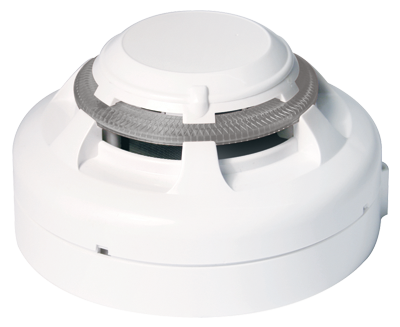 In line with our ongoing commitment to continuous improvement of our product lines, Nittan are delighted to announce the availability of our new EV-PYS Photoelectric smoke detector complete with integral sounder. This is an improved detector combined sounder product similar to and intended as a fully backward compatible drop-in replacement for the outgoing EV-PS. The previous EV-PS product proved to be a very successful launch of Nittans detector with integrated sounder range, however its new replacement the EV-PYS comes to the market with some exciting new technological advances centred on an enhanced new “PY” smoke sensing chamber. A spherical feature within the smoke chamber, providing unrivalled performance for scattering light, plus an Orange LED, which significantly improves response across the fire spectrum. Chamber construction designed to minimise effect of dirt/dust contamination with a fine micromesh made of stainless steel to prevent ingress of even the smallest insects which can create false alarms. Going forward, this new “PY” chamber technology will form an essential building block for other planned new device developments. Please note, once current stocks of EV-PS products are depleted they will be made obsolete. However to ease the transition from old to new products, the new EV-PYS product is suitable as a direct replacement for spares and retro-fit applications of any older EV-PS without panel upgrades or type code changes. Despite the many technological advances, to further ease the sales transition Nittan have decided to benchmark the price of the enhanced new EV-PYS at the same point as the outgoing EV-PS.